Static Medium: It seems as if the characters in your paintings are on always on the brink of making a decision or are preparing to explore the unknown. A sense of uncertainty is often evoked in the viewer of your pieces. Would you say these are feelings within yourself when you begin a painting, and if so is there a sense of resolution to these feelings when you complete a piece? Aron: I think you're right, there is a parallel between the characters and starting a painting, and having all that potential of a blank canvas. My paintings are subject to changes right up to the end, so there is a lot of uncertainty. By the end all those potential paths are reduced to one. It’s nice to have a finished painting, yet the resolution is a let down in that sense. I prefer to be at the beginning, as you said, “preparing to explore the unknown." 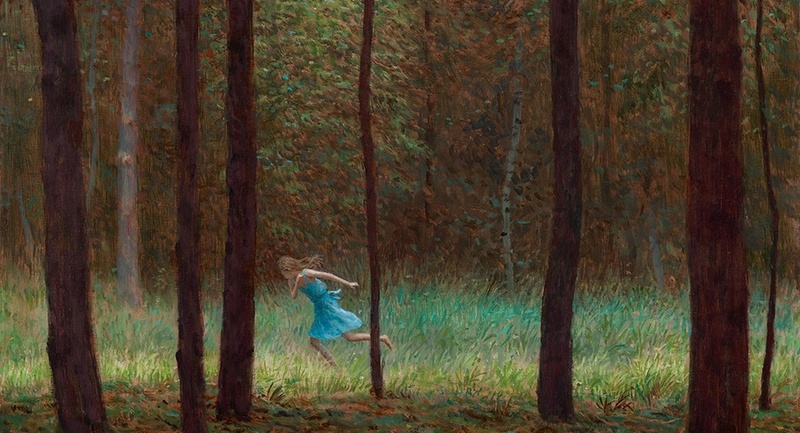 Static Medium: I enjoy the fact that the viewer can easily interpret the figure in “Bonny Doon” as either running towards something, or away from something. From your perspective, does one of these hold more true? Aron: I think she is running away. I was thinking about Renaissance paintings of Adam and Eve leaving the Garden of Eden. Masaccio's painting in particular is very expressive, one feels the distress in the body language of the figures. Static Medium: What was your process for creating this painting? Aron: I had the environment first. The environment was really good, and it seemed like I could put almost anything in there and it would work. I tried out different things and figures before ending up with the woman running. When I put her in, it was like “okay, that’s it!” The environment is very still and static- all vertical and horizontal shapes. She’s the opposite- kinetic and angular, which is what it needed. Static Medium: The title “Bonny Doon” fits this piece like a glove. How do you go about naming your paintings, and what inspired this particular one? Aron: Where I grew up, in Santa Cruz California there is a very small town nearby in the hills called Bonny Doon. It was the source of a lot of local urban legends that I remember hearing, about witches and devil worshipping and stuff like that, and the actual town does have a mysterious quality. It’s literally very dark there because it’s nothing but giant redwood trees. It felt like an appropriate place for the painting. Titles are not that important to me. A title can expands the story, but It shouldn’t add too much, in my opinion. It can easily distract from the visual information. Static Medium: Do you have any upcoming projects or shows that you’re excited for and are able to share a little bit about? Aron: I've been starting a lot of new paintings. To me it's the most fun part, just making stuff without editing.